From the way they came together in 2012 through how they first began writing songs to how none of the five songs on last year’s musically adventurous release Paradis, Possiblement runs under six minutes in length, there are few aspects about the journey of Moncton band Les Jeunes d’Asteure that has been conventional. “It was on the Acadian holiday [Aug. 15] in 2012 that myself, [guitarist] Patrick [Belliveau] and [guitarist] Jason [LeBlanc] had this idea that we wanted to start a band,” vocalist Remi Belliveau says. Not long afterwards, drummer Martin Goguen and bassist Remi Frenette were on board. Buoyed by the enthusiasm of getting a band off the ground, Belliveau shares the distinct lack of musical experience between them didn’t faze them in the least. 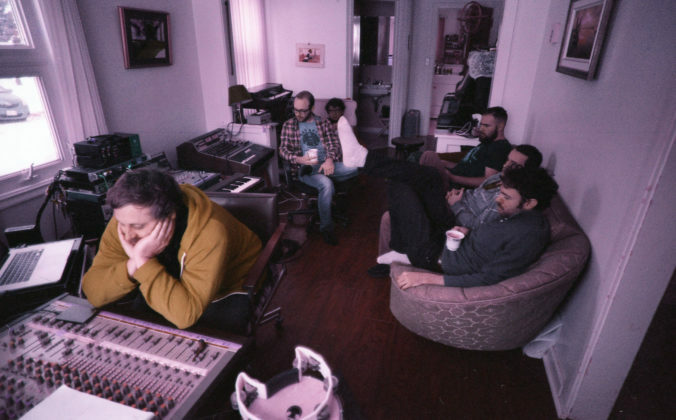 After releasing their debut four-song EP Awesomerie Sessions in 2013, the group buckled down to begin the process of writing its follow-up effort, Paradis, Possiblement, which would not see the light of day until almost three years later. The group began recording virtually all of its rehearsals, after which guitarist Jason LeBlanc would pour over the tapes with the hopes of finding aural gold that could be pieced together with other snippets to form a complete song. “There were many times that we frustrated ourselves in the process of trying to figure out how to make it work. And in the beginning, it didn’t work, but as the project progressed and we delved more deeply into the concept, the ideas started to come more easily,” Belliveau says. Recorded over the course of 10 days in Charlo, N.B. with producer Pierre-Guy Blanchard, Belliveau shares the group was routinely turning in 12 hour days in an effort to make the most of their time. After having the bulk of the record committed to tape, Belliveau estimates he spent upwards of another 50 hours recording voices and additional instruments to help accent the group’s songs. As the group found themselves both artistically and musically inspired by the likes of Les Hotesses d’Hilaire and Les Hay Babies, Belliveau says they were aware early on that following the “standard” formula for releasing new music wasn’t going to do the trick for Paradis, Possiblement. This Thursday, Friday and Saturday, at Moncton’s Galerie Sans Nom – located at 140 Botsford St. in Room 16 – Les Jeunes d’Asteure are following through with their unconventional means of getting their music out to the public. The group will be conducting a pop-up shop where visitors can purchase vinyl copies of Paradis, Possiblement in conjunction with a variety of activities, including a poetry reading, a viewing of the movie Snakeeater and more. The pop-up shop will be open from approximately 10 a.m. to 11 p.m. on July 6, 7, and 8.